Fuse Foam is the latest addition to the CSI family of products for managing termites and other wood destroying pests. Control Solutions Inc. (CSI) of the ADAMA Group is pleased to announce the launch of Fuse® Foam Ready-to-Use Termiticide/Insecticide. Fuse Foam contains Fipronil and Imidacloprid, the same proven, non-repellent active ingredients as Fuse® Termiticide/Insecticide, but in a ready-to-use foam. The 30:1 expansion ratio foam is for direct injection into termite and ant nests and galleries, structural voids, and other listed sites. Fuse Foam is the latest addition to the CSI family of products for managing termites and other wood destroying pests. This Combination Chemistry® product utilizes both Fipronil and Imidacloprid in a ready-to-use, expanding foam aerosol. 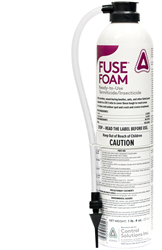 Complete with tubed applicator and two tips, Fuse Foam will seek out and destroy pests. Fuse Foam gives PMPs the opportunity to begin treating a structure immediately for termites; right on the sales call. Control Solutions began as a family owned business in 1958 and is built on to the commitment of serving the professional pest control and retail markets. CSI has added product lines for the Industrial, Lawn and Garden, Turf, Animal Health and Biocide markets, and is working with over 80 distributors serving those markets. Control Solutions maintains relationships with chemical manufacturers worldwide and provides a ready supply of products in distribution warehouses across the U.S. The partnership with ADAMA, formerly Makhteshim-Agan Industries, multiplies Control Solutions’ agility in continuously adding new products to meet the needs of professionals and homeowners. "The one constant since the beginning in 1958 is our mission focus: to seek out and distribute effective and economical solutions for our customers," stated Mark Boyd, President and founder of CSI. ADAMA Agricultural Solutions Ltd. is a leading global manufacturer and distributor worldwide of crop protection solutions. The Company supplies efficient solutions to farmers across the full farming value-chain, including crop-protection, novel agricultural technologies, and complementary non-crop businesses. In 2013, the Company’s revenues were over $3 billion, and it is ranked seventh in the world in the overall agrochemicals industry. The Company is characterized by its heritage of innovation, farmer-centric approach to product development, and it’s observance of strict standards of environmental protection and quality control. For more information, visit us at http://www.adama.com.